In 1951, while living in Belgium, my birthplace, I was accepted into the US-sponsored Fulbright Scholar Program and was assigned to study at the University of Oregon in a town called Eugene. But “Where is that?” I asked myself. I found a two-page map of the United States, spread it open, and started with the East Coast. There was no Oregon there! Nothing south of Chicago either! East of the Rockies: still no Oregon! 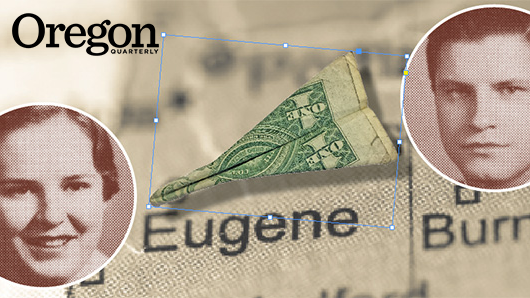 Finally, north of California, there was Oregon, a state the size of a large stamp but with no Eugene on its map. In Europe, university towns were renowned and always appeared on maps. It was only when I received my train tickets marked with the destination “Eugene, Oregon” that I could believe in the town’s existence. I arrived at the university with nothing arranged in advance regarding tuition, academic objectives, or room and board. I had only $100 with me because, in Belgium, US currency was still being rationed. Fortunately, several welcoming Ducks helped me get settled. The UO waived my tuition because the university was short of students after the GIs who flooded colleges for free after World War II had, by then, ended their studies and left. I was able to enroll in the MBA program I wanted. For room and board, I would be the guest of the Sigma Chi fraternity, which had voted to adopt a European student and pay for his room and board by increasing its 40 members’ monthly charge from $40 to $41. This generous initiative had been inspired by the 1948 Marshall Plan, which was created to help Western Europe recover after the war. What a year! The UO MBA program was exciting, the teachers were much more interesting and inspiring than in Belgium, and the Student Union was a revelation as I got to dance to the swing tunes played by Louis Armstrong and other visiting big bands. I made great friends at Sigma Chi, where I learned to sing its “Sweetheart” song. Best of all, I met my wife, Luella Adams, BA ’55, at a Newman Club dance for Catholic students. Back then, a girl who wanted to dance with an already dancing boy passed a broom to his female partner, who had to give up her partner to the girl with the broom. That’s what Luella did, and the rest is history—a marriage and a family. I received my MBA in June 1952 and worked at the nearby Weyerhaeuser woodmill—my very first job. In September 1952, I returned to Belgium where I got a job in a Brussels department store. However, my fiancée and I decided to live in the country we had come to love. We returned to the States in 1955, got married, and eventually had three children. I found a job at Jantzen in Portland and began teaching on a part-time basis at Portland State in 1956. Liking it, I quit my job to teach full-time at the University of Portland, which financed part of my PhD studies at the University of Washington, where I majored in business and society. My degree and early publications earned me a teaching position at New York University, and we moved to the Big Apple in 1964. Later on, I taught at Baruch College, the Business School of the City University of New York. I specialized in international business—which allowed me much foreign travel and to become president of the Academy of International Business. I retired in 2006 after 50 years of teaching. All of this happened thanks to the University of Oregon and its mysterious location in Eugene. I revisited Eugene in the 1980s and discovered that the Sigma Chi house had burned down. Still, to this day, I marvel at what a difference the $1 room-and-board charge increase and other UO benefits made for my life. I discovered a welcoming and generous people, a vibrant democracy, a place for opportunities unavailable in Belgium, and “a real slice of America” in Eugene. How could I have asked for anything more? Thank you all!